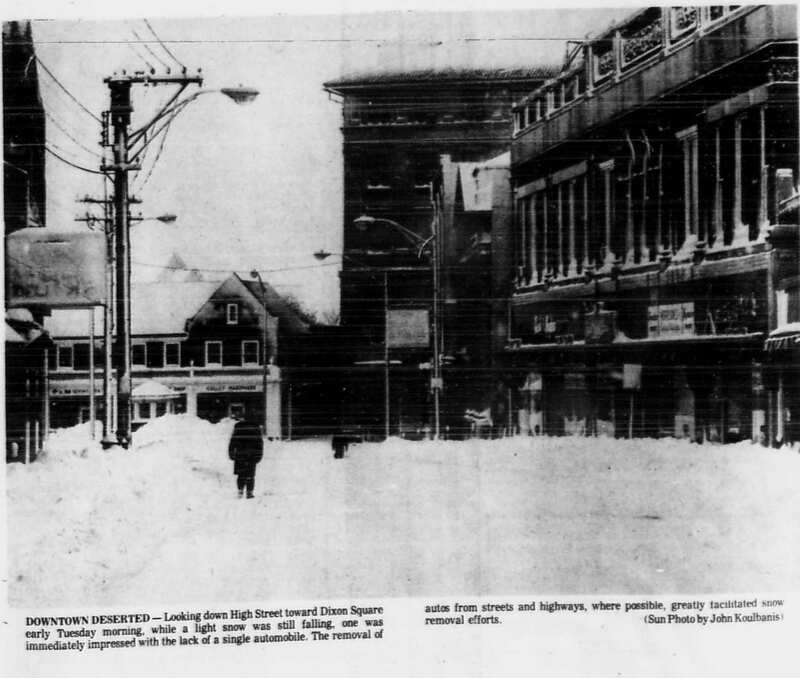 If you were to ask anyone in New England over the age of 50 about the Blizzard of 1978, chances are, they could tell you a number of stories from the week that Rhode Island stood still. Westerly was deeply affected by the storm, as was the entire northeastern United States. Preparations began on Sunday, February 5 and it was not until the following Monday, February 13, when life fully returned to normal. Below, we present a day by day look at the Blizzard of 1978 in Westerly. At 5 a.m. on Sunday morning, WPRO Providence issued their initial Winter Storm Watch, which served as an early indication of what was to come. That evening, they issued a Heavy Snow Watch at 5 p.m., predicting more than six inches of snow, while also warning of potential heavy gales. Late in the day, low temperatures caused the fish ladder at the Potter Hill Dam to freeze over. A picture of this scene appeared in the Westerly Sun the following evening. At 10 a.m., snow began to fall heavily in Westerly, making travel difficult to impossible. By noon, Coastal Flood Warnings were issued for Narragansett Bay, indicating that tides could run as high as two to four feet above normal. Superintendent of Westerly Public Schools, Felix J. Torromeo announced that afternoon Kindergarten would be cancelled and all Westerly schools were to be dismissed at 1 p.m. Despite the early dismissal, issues plagued the school system. At the height of the storm, elementary school students were stuck on immobilized school busses in several areas, including Chestnut Street, Woody Hill Road, Beach Street, and Upper High Street. In some cases, students did not arrive home until as late as 5 or 6 p.m.
Westerly Police Chief James R. Gulluscio noted that he fielded about 30 calls from concerned parents when their children did not arrive home when expected. Additionally, approximately 200 students were left in the gymnasium of State Street School with only one teacher’s aide around 2 p.m.
At 7 p.m. that evening, the negotiating committee for Council 94 of the American Federation of State, County, and Municipal Employees, led by director Giovanni Folcarelli, met to discuss whether or not to go on strike due to a contract dispute. Although the outcome of that meeting is unknown, disaster was narrowly averted, as the 12,000 union members did not begin their strike during or directly after the storm. The snow continued to fall throughout the evening, and Governor J. Joseph Garrahy declared a snow emergency for the State of Rhode Island. Members of Westerly’s 169th Military Police Company spent the night checking Interstate 95 for stranded motorists. Those who were located were transported to the armory on Dixon Street. Overnight, 12 deaths due to the storm were reported in Rhode Island, although none were in Westerly. The snow finally let up at noon on Tuesday, at which time, measurements were taken, and it was claimed that Westerly received between 20 and 24 inches of snow. The application to Washington D.C. filed by Gov. Garrahy was accepted and on Tuesday morning, President Jimmy Carter official declared the state a disaster area. At 4:30 that afternoon, the president further declared Rhode Island a Federal Emergency Area. Throughout the day, winds remained strong, with gusts over 50 miles per hour, creating dangerous snow drifts and piling on to already massive peaks. Temperatures also remained dangerously low, with an overnight wind chill of just 10 degrees. Newspaper and television reports of the storm brought updates to Rhode Islanders who steadily began to realize the ultimate havoc the blizzard wreaked on the entire state. According to authorities, as many as 1,000 cars were stranded along many roads. Captain Frederic Ward of the Military Police reported that there were still 15 stranded motorists who remained at the armory that evening. At the storm’s peak, 2,100 Narragansett Electric customers had lost power, but by 9:30 a.m. on Tuesday morning, service had been restored to all but 275 of those customers. All schools and town hall buildings were closed for the day. Federal troops arrived in Rhode Island from Fort Benning, Georgia throughout the day on Wednesday. The troops were assigned to Rhode Island after President Carter’s confirmation that the state was a federal emergency area. Because of its status as an emergency area, Rhode Island was responsible for only 25 percent of the cost of the equipment required to clean up. Schools remained closed, as many roads were still considered impassable. Highway crews continued their dedicated work, and as a result, most main roads in Westerly were cleared by the start of the day, although secondary roads were still covered in snow. Locally, banks and some stores reopened, but restaurants throughout town were still shuttered on Wednesday. By this time, some establishments had not had the opportunity to shovel their sidewalks, and as a result, pedestrians were, at times, forced to walk in the streets of Downtown Westerly. After another day of cleanup efforts, Westerly continued to move in the direction of returning to normal. By Thursday, most local stores had reopened. According to the Westerly Sun, the supplies of “milk and basic foodstuffs” were “adequate” as were gas and heating supplies, which were essentially to keeping homes warm during the cold snap. Pedestrians were seen flocking to stores and restaurants in the downtown area throughout the day on Thursday, another sign that the town had begun to come out of its snow-induced hibernation. Residents were urged to clear their sidewalks, as mail service was set to resume for the first time all week. After an hour-long conference with Chief Gulluscio, Public Works Director James H. Crowley, and Town Manager John F. Donnoe, Superintendent Torromeo determined it would be best to keep Westerly schools closed until Monday. It was also reported that normal police activities were being conducted using both volunteer and Army National Guard four-wheel drive vehicles and police cruisers. Most of these actions involved transporting doctors and nurses to and from Westerly Hospital. For the first time since the snow began to fall, some employees of the Westerly town garage on Beach Street were given a reprieve after many had worked 40 hours straight without much opportunity for sleep. While Westerly public schools remained closed, other local school districts, including Stonington and North Stonington, resumed classes for the final school day of the week. Travel throughout the state was severely hindered due to roadblocks set up by Rhode Island State Police. On Interstate 95 in North Stonington, cars heading northbound beyond East Greenwich were halted and not allowed to proceed. Areas in northern Rhode Island had received significantly more snow, including Burrillville, which reported a total of 33 inches. The ban on travel beyond East Greenwich caused many truckers to be stuck in place as police prevented them from advancing to their intended destinations. Those who were interviewed claimed that a three-day layover was something they had never seen before. The cargo carried by these drivers risked spoiling. They also realized that even if they made it through Rhode Island, they would face issues in Massachusetts, which had issued a non-emergency driving ban. Over the weekend, day-to-day life in Westerly returned to normal, due in large part to the tireless efforts of Westerly Town employees. On Monday, students were finally allowed to return to school. Long term effects of the storm were also notable, as snow drifts damaged seawalls, beaches, and protective dunes, leaving beaches open to further damage by additional storms. Although the Blizzard of 1978 left Westerly buried under nearly 24 inches of snow, the tireless efforts of town workers, citizens, and emergency personnel allowed the community to survive relatively unscathed. While many will remember where they were when the storm hit our town, it should be remembered for the strong response which avoided tragedy. The Blizzard should be remembered locally for the way the community came together and survived one of the greatest storms the town had ever seen. United States Department of Commerce, Natural Disaster Survey Report 78-1, Northeast Blizzard of ’78, February 5-7, 1978: A Report to the Administrator, pg. 28. “Weather Bureau Predicts Up to 16 Inches of Snow” Westerly Sun, 6 February 1978. Coyle, Pat, “Officials to Seek Ways So Future Storms Won’t Strand Pupils” Westerly Sun, 8 February 1978. “Area Paralyzed by Deadly Snow” Westerly Sun, 7 February 1978, pg. 1. Most accounts state the total snowfall was 22 inches, however, some account suggest it was 20 and at least one indicated 24 inches. Rosati, Mark, “U.S. Troops Coming To Aid in Clean-Up” Westerly Sun, 8 February 1978, pg. 1. “Area Paralyzed by Deadly Snow” Westerly Sun, 7 February 1978, pg. 2. “General Store Fire” Westerly Sun, 8 February 1978. “Westerly Slowly Returns to Normal” Westerly Sun, 8 February 1978, pg. 1. Coyle, Pat, “Motorists Urged to Avoid Travel” Westerly Sun, 9 February 1978. “R.I. Schools Stay Closed Friday Conn. Expected to Hold Classes” Westerly Sun, 9 February 1978. Hollis, Todd, “State Police Form I-95 Roadblock Halting Motorists Entering R.I.” Westerly Sun, 10 February 1978. United States Department of Commerce, Natural Disaster Survey Report 78-1, Northeast Blizzard of ’78, February 5-7, 1978: A Report to the Administrator, Table 1. United States Department of Commerce, Natural Disaster Survey Report 78-1, Northeast Blizzard of ’78, February 5-7, 1978: A Report to the Administrator, pg. 1. I was actually on the school bus on Chestnut Street. I still remember, it was tilting and didn’t have all the wheels on the ground. I lived on Chestnut and it got stuck at the Chestnut/School St end. As it took the corner it tilted. There were a number of dads there telling us kids to get to the far side of the bus and they pushed it to get it back on all its wheels. Myself and friends were also in the picture that was of the kids in the school taken by The Westerly Sun – Koubanis I believe. Still have the photo.